Did you know that today is National Pretzel Day? Yum! Since it’s a particularly yummy food holiday, I wanted to make a recipe my family and I could make with foods in our pantry. I always especially love to do recipes that my daughter can help out with. 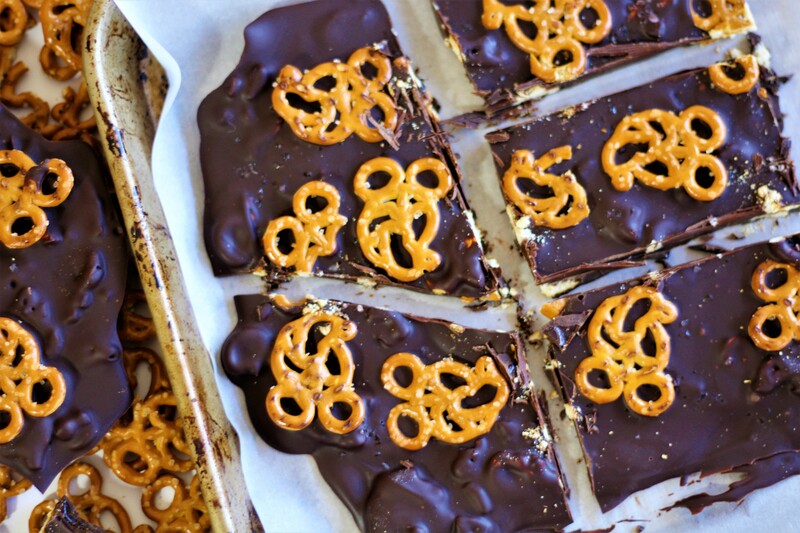 This Mickey Dark Chocolate Pretzel Bark recipe is the perfect sweet and salty dessert, and takes no time at all to make, so it’s great for your junior chefs to help out with this one! Combine your dark chocolate and oil in a bowl, and microwave for one and a half minutes, or until melted (stirring every 30 seconds). Alternatively, you can melt on the stove top. Just make sure you stir frequently and melt on low heat to prevent the chocolate from burning. Crush one cup of pretzels, stir into your melted pretzel mix. Line a cookie sheet with parchment paper, and pour your mix on the parchment paper. Top with sprinkles of sea salt and more Pretzels. Place in the refrigerator for 20 minutes to solidify.